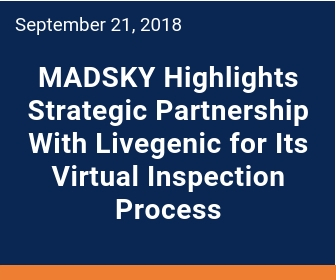 ENGLEWOOD, Colo., September 21, 2018 (Newswire) -MADSKY announces their partner of the month for September: Livegenic. The partnership, which started in 2016, has produced a robust virtual inspection platform designed to speed up the managed repair process. Contractors in MADSKY’s nationwide network successfully use the platform to conduct live calls between an in-house adjuster, appraiser and policyholders while gathering real-time images. The cloud-based technology provides MADSKY the ability to complete an estimate in less than 48 hours. The partnership further enhances the skill set of MADSKY’s contractor network with access to online training, tutorials, software updates and sharing of best practices. “At MADSKY, we are committed to providing a frictionless customer experience for every single property claim. Livegenic's technology allows our contractors to provide excellent customer service to policyholders and return their homes to pre-storm conditions as quickly as possible,” said LC Nussbeck, founder and CEO of MADSKY. “MADSKY, like us, is driven by innovation and a commitment to help insurance organizations reduce costs and improve customer satisfaction. Our Livegenic App provides the platform for MADSKY to continue delivering the best customer experiences while connecting every part of the claims ecosystem,” said Joel Edick, director of customer solutions at Livegenic. About MADSKY MRP LLC: MADSKY is the first roofing-focused managed repair program (MRP) in the country, providing access to unmatched pools of vetted and trained professionals across the roofing repair process. MADSKY’s “network of networks” is the largest collection of roofing contractors in the U.S., consisting of more than 3,000 certified roofing contractors and a supplier network of more than 3,600 across all 50 states. MADSKY’s proprietary Frictionless Customer Experience (FCX) software connects the carrier, contractor and consumer, allowing for seamless communication and optimal utilization of all resources. Headquartered in Englewood, Colorado, MADSKY is quickly redefining and enhancing the insurance claims experience for roof repairs or replacement.